Well, for this “date night”, I think we were looking to get the Senior Citizen Discount, because we definitely got to Mr. Yum for the early bird special. There was not a single other person beside the staff in the restaurant, when we arrived. We wanted to hit the new Woody Allen movie “Midnight in Paris” (which we loved), at the Tower Theatre down the street. By the time we completed our meals, all the “cool kids” had arrived in their swanky attire. Glad we missed that. FOOD: The menu is fun, the food is perfectly designed – almost too beautiful to eat. They implemented a modern twist on a lot of classic Asian fare, mostly via the actual dish construction & plating. Overall, this was effective, but there were a few instances where the “twist” actually interfered with the overall taste of the dish. SERVICE: our waitress was very personable, attentive and even went out of her way to find out where they bought their wine glasses. If you are interested, they are from IKEA (I was shocked…they looked pretty classy). AMBIANCE: very put together. great lighting and attention to detail, but not over the top. 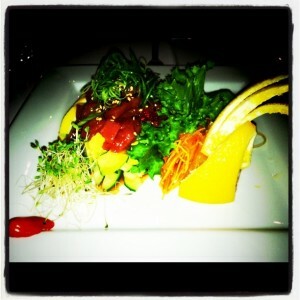 Tuna Tartar: Tuna mixed with Toro sauce topped with Avocado and Cucumber. This was my favorite thing we ordered. It was light, fresh and very very flavorful. Adam and I were having a chopstick war over the last few bits of this. I would definitely order this again. 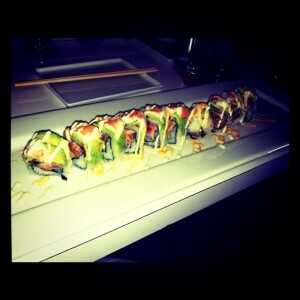 Dragon Roll: Tempura Shrimp and Masago topped with Avocado and Eel Sauce. The plate was beautiful and the tempura shrimp was perfectly battered and crispy. 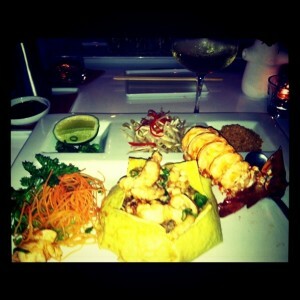 Lobster Pad Thai: Crispy Lobster Tail Sautéed Rice Noodles with Scallions, Bean Sprouts covered with Egg. I enjoyed it over all, but the “deconstructed” way it was presented, kinda messed with the traditional flavor of Pad Thai. For instance, you might not be able to tell from the photo, but the egg is actually the container for the rice noodles. Pretty cool as far as visual appeal, but I do enjoy the flavor of the egg in Pad Thai and this set up made it kind of difficult. I’m glad I ordered this though. It was pretty cool.